ISIS Claims Responsibility As Scores Killed In Baghdad Truck Bomb : The Two-Way The suicide bomb hit a major marketplace in a predominantly Shiite neighborhood of Baghdad. Iraqis gather at the scene of a truck bomb attack at a vegetable market in Jamila district, eastern Baghdad, Iraq, on Thursday. The self-declared Islamic State has claimed responsibility for a truck bomb attack in Baghdad that has killed at least 67 people. Reports of casualties vary. The 67 figure comes from The Associated Press, but Reuters says 76 are dead and al-Jazeera is reporting "at least 55." 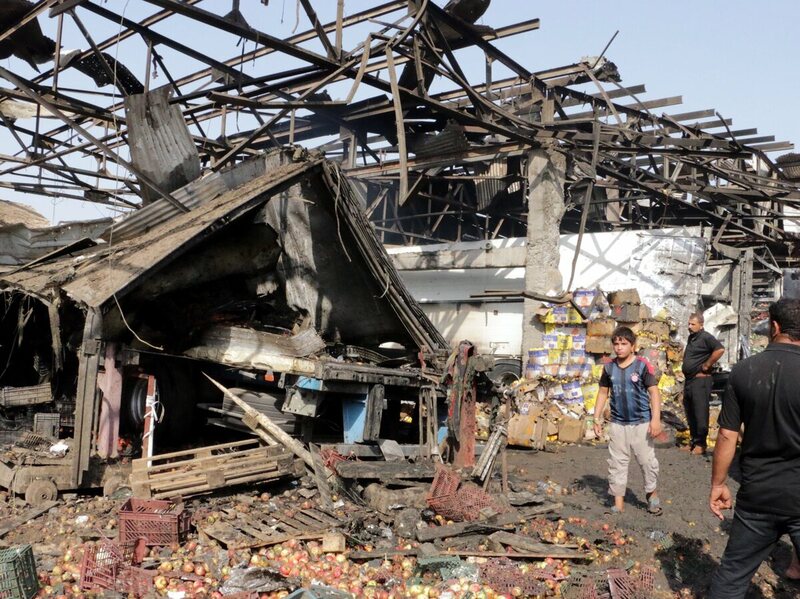 The AP reports: "The truck detonated in the Jameela market in the Iraqi capital's crowded Sadr City neighborhood shortly after dawn, according to two local police officers. They also said that at least 152 people were wounded in the attack. The market is the main center for produce and food sales in the Iraqi capital." "Many people were killed and body parts were thrown on top of nearby buildings," police officer Muhsin al-Saedi is quoted by Reuters as saying. "On Thursdays the market is especially crowded because people come from the other provinces to stock up on food for the weekend," an unnamed officer was quoted by the AP as saying. The Islamic State published a statement online saying it had carried out the suicide attack. NPR's Alice Fordham reports: "After ISIS switched from being largely an insurgent movement to governing swaths of territory in Iraq, the number and size of car bombs in cities dwindled slightly. But in recent months there have been several so-called spectacular attacks, including two in the province of Diyala, which killed dozens of people."